2018 Leaf Metal Draft - Baseball Card Checklist	Overall rating:	2	out of 5 based on 1	reviews. 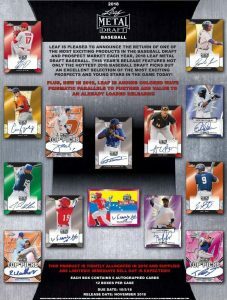 2018 Leaf Metal Draft Baseball is an all autograph product that highlights MLB prospects and some of the top 2018 MLB Draft Picks. 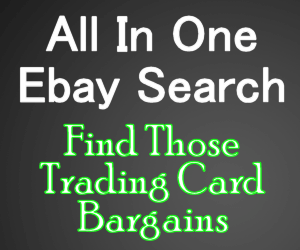 Offering 6 autographs per box, this release offers some shiny cards that, despite not being licensed, are still an attractive buy, especially for fans looking to get autos of the future stars. This is a straightforward product that offers strictly autographs, no base, no inserts, and no memorabilia. Fans should expect to pay in the neighborhood of $90USD per box.